It was the type of dream that when I woke, I was convinced that I was still in a dream. The other world seemed more believable. Maybe I just liked it better? I was walking through the family room on the lower level. It was mid-day. The back door was open like always and I could hear the neighbor's parrots talking in the sunlight. My mobile phone rang. It wasn't it's normal ring-tone. I don't typically answer calls that I don't recognize here... it's too risky. Extortion is a real fear. But I couldn't resist the ring-tone. Somehow it felt familiar. I took the call, held the phone to my face and said, "hello?" The voice stopped me. In fact, it stopped everything. I quit breathing... and then began gasping. I couldn't speak. I just took in deep breaths as tears fell down my cheeks. I tried to say his name, but I couldn't form sounds. I finally managed to whisper out... "Pop." By now the tears were a constant stream down my face and I was nearly hyperventilating. Kellie came into the room and I grabbed her arm as I put the phone on speaker. "It's Pop." 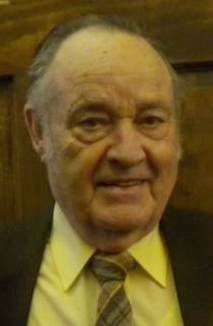 My grandfather (Pop) passed away this past May. He was my spiritual mentor. He was my conscious. He was the one who loved me more than I deserved to be loved, and was also the one who was in my face when I needed corrected. From the time I was old enough to understand, he was telling me that God could use me to do great things. I disappointed him some in life. I felt like I never was able to measure up to his expectations. So many days now I wish he could take part in what we're doing. Sometimes I just feel alone. I feel inadequate. I feel foolish. I still make dumb mistakes. Kellie looked at me with confusion and disbelief as Pop's voice came from the phone, loud and clear like he was in the room. "Buck, it's me... ole' Pop. I love you and I'm so pleased with you. You're doing it. You keep on pushing forward. You're doing it. You don't give up. No matter what. No matter how hard it gets, you just keep kicking that old devil in the face. Keep at it Buck. Ole' Pop loves you." I wanted to say so much! All I could get out of my mouth was, "Pop... how are you doing this? I miss you so much!" But his words overlapped mine. He said, "I gotta go... I love you." I heard the phone click off. The call was over. I stood there looking at Kellie. I said... "It was Pop." She was nodding her head yes, both of our faces wet with tears. I kept saying over and over... "it was really him. It was really him. It was really him." And that's when I woke up in bed, my face and pillow wet from the real tears that had been pouring from my face. I don't know what you believe, and I won't try to convince you. But I will tell you this. That ole' bird made it. My Pop made it to heaven. He always worried that he wouldn't, but God took my ole' Pop home. And somehow... Pop found a way to let me know. Keep fighting. Keep pushing. Stay the course. Finish the race. You don't give up. No matter what. Ole' Pop loves you. It was really him. I have no doubt.